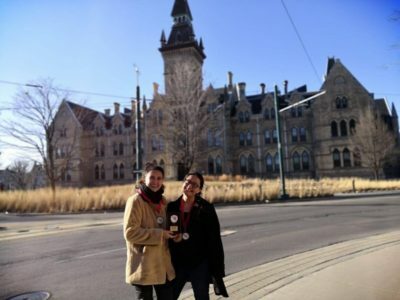 The Open Champion of the North American Womxn’s & Gender Minorities Debate Championship 2019 is the hybrid partnership Ella Baker (Harar Hall: Carleton/Hart House). They won from Closing Government on the motion “Assuming the public would never find out, THP historical narratives that prioritize equal representation throughout history, even if people and events need to be fabricated”. Their opponents were the teams Sonia Sotomayor (Carson Crane, Sukhmani Kaur; Cornell) in Opening Government, Sunitha Krishnan (Emily Xie, Melissa Giblon; Western/Hart House) in Closing Government, and Rosalind Franklin (Yael Lewis, Micaela Lewis; McGill) in Closing Opposition. The Novice Champion was Marsha P. Johnson (Zuha Tanweer, Maria Ikeda: Hart House) in Closing Government on the motion THR the social . The novice finalists were Michelle Obama (Maya Benziger, Christina Wang: Bates) in Opening Government, Corazon Aquino (Jami McElrea, Seneli Seneviratne: Carleton) in Opening Opposition, and Emilie du Chatelet (Anna Ehli, Rachel Dames: Colgate) in Closing Opposition. Judging the Novice Final was chair Johanna Richter, and alongside them were panelists Amanda Liang, Emma Darcy, and Vivian Zhang. The top speaker of the tournament was Harar Hall (Carleton) with an average of 81 speaker points. The top novice speaker was Emily Xu (Queens) with an average of 79.2. The top ESL speaker was Marcela Gómez (Tec CEM) with an average of 78.6. 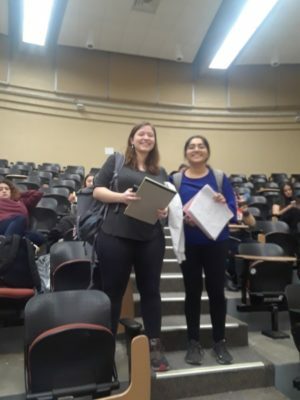 The North American Womxn’s & Gender Minorities Debate Championship 2019 was hosted by the University of Waterloo in Ontario, Canada and featured women and gender minority participants from the US, Canada, and, for the first time, Mexico. Round 4: Assuming it could be done without placing the burden of secrecy on adults. THP a world in which individuals are unaware of the existence of organized religions for the duration of their childhood. Infoslide: The “American Dream” refers to the notion that, regardless of one’s demographics, one can significantly improve one’s quality of life through hard work and persistence. Infoslide: Rupaul’s Drag Race is a popular TV show that portrays the drag community. This show has helped popularize drag culture and elevate diversity in the mainstream media. The host, Rupaul, is arguably the most well-known drag icon in the world and plays a large role in creating the narrative for the drag community; however, Rupaul has been under scrutiny for not allowing drag kings or trans women who have undergone gender reaffirmation procedures to participate on the show. Grand Final: Assuming the public would never find out, THP historical narratives that prioritize equal representation throughout history, even if people and events need to be fabricated. The CA team: Meghan Ackland (CA: Canada); Alex Holgate (DCA: Canada), Vale Hernandez (DCA: Mexico), Clarence Allister Logan Bronte (DCA: US), Emma Rose Wirsching (US: DCA), Patricia Johnson-Castle (DCA: Canada), and Jessica Zhang (assistant DCA: Canada).